As will Hardline and the upcoming Battlefield 1. 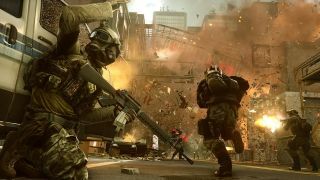 Battlefield 4, Hardline, and the upcoming Battlefield 1 are to get new user interfaces, a post on the Battleblog reveals. This new UI has been designed to "improve the experience of playing with friends", and will allow you to "easily swap" between all three games, providing you own them. Along with a recommendation engine that will suggest maps and modes you might like to play, you'll be able to create a squad before entering the game. The new UI is now rolling out in beta form for select Battlefield 4 owners, with more testing opportunities "in the coming months". It sounds like the new UI will be in Battlefield 1 at launch on October 21, and then will come to Hardline soon after, so I'd expect the new UI to be consistent across all current Battlefields by the end of the year.